Krishna has finally received his new ultimate evolution and has been transformed into a top tier leader. While he may not be as overpowering as some of the heart cross leaders, Krishna has numerous advantages including the most flexible team building, ability to focus on rows or TPA, along with being able to fully utilize any given board. 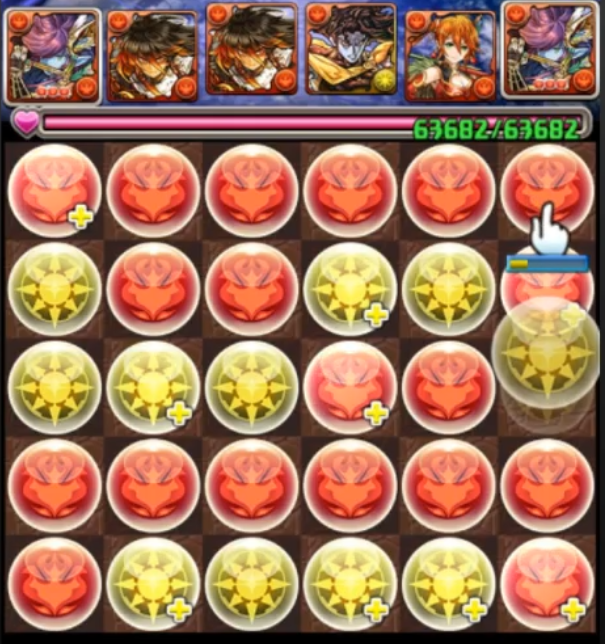 Krishna is capable of clearing end game content including Arena 3. Super evolution Krishna provides a fresh spin on the mono-colour combo leaders as he beautifully combines damage and survivability. This hybrid team is somewhat unprecedented and creates what is essentially the strongest mono-colour tank team available. Krishna is able to be favourably compared to Super Ultimate Ra Dragon and top tier heart cross leaders due to his innate durability and burst damage potential. He completely outclasses any other mono-colour tank leader (think Lucifer or Pandora ) as there is no type restriction and the multiplier in all aspects is significantly higher. With that in mind, I dearly hope that GungHo begins to address older tank teams and revitalize them to help compete with the heart cross meta. Fully maxed out Krishna teams can potentially achieve 60k HP in solo mode (could reach 100k in coop) which is more than sufficient for surviving any non-execution ability. Furthermore, you are able to easily stall due to 2.25x RCV and by matching a single clump of fire orbs (to only trigger 1 combo). In addition, these defensive benefits are completely passive and are only lost if your leaders are bound. This provides a unique advantage over lower shielding options such as Ronove and Gremory as they are forced to match their cross every single turn to remain durable. Heart cross teams are reliant on having 5 heart orbs present to trigger their leader skill and defensive component. Without those 5 heart orbs, they are just as fragile as any other team. This can prove challenging without the usage of actives as it is statistically very difficult to have 5 new heart orbs appear every turn (have to clear all 30 orbs in theory). Thus, they may be subject to vulnerability, active skill usage, or having to alternate between crossing and not crossing to survive. Higher shielding leaders such as Myr or Kaede have an effective 4x HP / RCV when they heart cross, but leaders such as Ronove and Gremory are essentially on par with Krishna’s defensive multipliers if a heart cross exists. Another benefit of running Krishna as a leader is an unconditional multiplier to any fire monster. This means you can choose the best cards in your box and do not have to be afraid if they remove heart orbs or lack a certain typing. In addition, you are able to stack fire rows for heavy burst damage that could allow you to omit a burst damage active. However, you can still elect to not match a row in order to control your damage along with the number of fire combos. This may mean you do not always use your skyfall active on cooldown, but you always have the option to gain a permanent +15% to fire orbs appearing. Due to the fully open sub pool for Krishna, his drawbacks are somewhat small as you are able to bring any sub you wish to counter the various dungeon mechanics. However, his largest drawback is his vulnerability to binds. This problem is two-fold as he is being released in an era with numerous bind immune leaders and losing all his defensive benefits at the same time. This forces players to bring some sort of bind protection and can come in two forms. There is a hard and soft bind clear. A hard bind clear is a card that is bind immune with a direct bind clearing active. This can be done via their natural active or through skill inheritance. A soft bind clear is using a card with the recover bind awakening and relying on a row of hearts to remove 3 turns. Naturally it is safer to use a bind immune card for this purpose (such as Rozuel ) or relying on someone like Yamato and either ensuring he is not bound or abusing coop as 1 team will not be bound. If using the recover bind technique, you are still able to trigger your leader skill through cascades as the game will register the cascading fire combo as a brand new match. In the above image, I have formed 3 fire matches, but if my leaders were bound, the leader skill would not register any of them. However, with the line cascade of fire orbs on the left, I would remove 3 turns of binds through the row and actually trigger the full multiplier as the leader skill registers a new match and then realizes there were more beforehand. Outside of this vulnerability to binds, Krishna does deal half damage to water bosses and is more susceptible to gravity based attacks. These are small downsides, but are worth mentioning. Krishna may share the same offensive leader skill component as Sarasvati , but he does not have to team build or play in the same manner due to his tankiness. You no longer have to rush through a dungeon with guns blazing as you are actually able to tank a hit and heal up. This means you can stall out problematic floors and do not need to use your skyfall active on cooldown. In essence, you deal approximately half the damage of Sarasvati and should be stacking fire rows to ensure you sweep tanky floors. There is little need to prioritize orb enhances as your two leaders already provide 10 and TPA is less efficient overall. With 12 orbs, rows will easily eclipse TPA and should be your primary focus. Subs with TPA can be seen as a bonus. This may sound unusual, but running a Two Prong card on a row heavy team can be dangerous as one card has the potential to spike significantly higher than the others. This is great for piercing high defense, but can be disastrous on absorption bosses (same can be said for Killer awakenings). Most of my recommendations are done based on the presumption of using rows. Rows help take you into more end game/future content as purely stacking orb enhances will not produce enough damage when bosses start having higher amounts of health. Enhance orbs also have diminishing values after you use orb changers to deal with those high health bosses. Krishna can stall and you should be going slowly in hard content to recharge actives etc. Orb enhances are great for easier content and for boards with only 9 fire orbs. You ideally want to run a tri-colour board changer with a synergistic active to create a 2/3 fire board for optimal damage and can either use inherits or original sub actives. The main advantage of this style of board changer combos over a dual colour one (such as Red Sonia ) is that you completely remove the randomness factor and would be difficult to have a board that has less than 2 fire rows. The following image shows an optimal 3 row board. I got one additional non-fire skyfall to bring my total combo count to 7. This is without the ideal Sanada/Urd combo as most of the orbs are enhanced. The listed subs are based on personal opinion and what I can theory craft and am always open to suggestions/edits. When composing your own team, you should always address the dungeon mechanics along with finding a healthy balance of utility and offensive capabilities. Keep in mind your recovery levels as it is the most important stat overall for clear consistency. I personally prefer high impact actives, aka those that generate larger amounts of fire orbs. Those who spawn 3 at random are considered low impact as you may not actually correct a bad board and have wasted an active slot. Sanada is easily the strongest sub you can run for your Krishna team. We have all seen the power of Akechi when used in conjunction with Haku as the 2/3 enhanced orbs are able to deal spectacular damage and allows many teams the luxury of not running an burst sub. The same logic applies to Sanada and his 4 fire rows. Sanada is capable of comboing beautifully with Urd or a Haku inherit but can even be used as a stand alone active for the heart orb generation. His main drawbacks are a lack of utility based awakenings, but that is what your other subs are for. Urd is the only on-colour board changer that produces a tri-colour board with hearts. Being able to simultaneously heal and deal damage can be paramount to success and she also has plenty of combo options to create a 2/3 fire board. Most notably, Urd can combo beautifully with Sanada and you should run the pair of them 11/10 times if available. Yamato is a wonderful example of a soft bind clearer and is one of the stronger options for a Krishna team. Naturally soft bind clearers excel in coop mode where they cannot be bound, but Yamato is still a viable option. One nice factor is the fire subtyping so he can potentially avoid various colour binds. All of that aside, Yamato has amazing synergy with Leilan . In addition, you are almost guaranteed to heal to full health after the enhanced heart orbs. Leilan is perhaps the second best natural board changer. Her active does not provide heart orbs like Urd, but she has rows and stronger awakenings overall. Despite a less ideal active, you can correct her via Skill Inheritance. Awoken Ares or either incarnation of Ares is wonderful as they are able to flood the board with ample fire orbs and essentially guarantee 12+ fire orbs for 1 row and full activation. Even though the additional skyfall buff may seem counter intuitive for Krishna, it can actually be advantageous as you can use your Krishna off-cooldown to better time the two fire orb generation. Awoken Ares is also one of the better inherits on Krishna. Cao Cao has a unique active as he is able to remove dangerous and water orbs and convert them to fire along with providing a single turn of delay. This delay can be invaluable against resolve bosses (such as Hino in Arena) or as a way to guarantee your safety or simply gain a turn to set up your board. He also has synergy with Urd if you are lacking Sanada or a heart breaker. Uriel is generally speaking, an inferior Yamato as he lacks a recover bind and his 4 autoheals go to waste. This is not to say he is a poor sub, more so he is outclassed by Yamato generally speaking. However, Uriel does have a few more combo options compared to Yamato such as using Saria or Gadius boards. Ultimately who you choose to use will be based on your box. Femme is a viable 5-turn orb changer who brings modest awakenings and a large chunk of RCV. While a heart breaker is less ideal in most scenarios (unable to heal and deal damage), her base cooldown is short enough to either upgrade via Antares or something new entirely. Minerva will become a powerful option when she receives her reincarnated evolution as she will be bolstered to 1,000 base stats along with a short 5-turn active. Granted a dark to fire has lower synergy (think Haku or Gadius), it does not remove hearts and can be easily inherited overtop. Furthermore, her bind immunity can allow her to act as a makeshift bind clearer through Skill Inheritance. Antares is another powerful option; however, their awakenings offer more utility than offensive capabilities as the enhanced fire orbs go to somewhat waste. That being said, the enhanced heal orbs are powerful for helping increase your healing potential along with retaining their plussed status post orb changer. Just be conscious of their God Killer awakening if you have to deal with absorption bosses. Chiyome is an underrated sub who has a powerful active when used in conjunction with numerous board changers as she changes light to fire. Furthermore, she does not remove heart orbs and can also be inherited over top. Just be conscious of her Balance and Devil killer awakenings. Gadius could have been a much stronger sub if he had a better active. His awakenings are wonderful from a utility point of view as he acts as a strong soft bind clearer. However, his active is unreliable at best as it generates 4 different elements with a modestly long cooldown. You are taking a gamble every time you use his active and unless you have something like Uriel to correct it. As such, it is wise to inherit something on Gadius to make a more reliable board changer. Belial can be a powerful sub if max skilled. His powerful awakenings and bind immunity can allow him to function as a more offensive Minerva if used as a pseudo bind clear via Skill Inheritance. In addition, his base active has synergy with Leilan along with providing a niche counterattack that can help you deal with certain resolve floors (most notably Zeus/Hera). Napoleon is a Fire Gala Exclusive who is able to produce 5 fire orbs at random (in JP) while providing 35% damage reduction for 3 turns. This is an interesting active as the 5 guarenteed orbs can help fix your board while the shield has value against gravity based attacks. However, the 5 enhanced fire orbs are somewhat redundant so he is not contributing as much damage as a heavy row sub would. On the other hand, the Dragon Killer awakening may have niche uses. Thuban is a respectable sub as he has both bind immunity and a recover bind awakening. Granted he does not make any heart orbs of his own, but can help out in a pinch. His active generates a row of fire at the top along with haste on an eight turn cooldown. By spawning 6 guaranteed fire orbs, you should be able to activate your full multiplier along with being able to fix any bad board changer. Perhaps the nicest aspect is that you can hoard fire orbs at the bottom without having them go to waste. Laila produces a row of fire at the bottom on a five turn cooldown. This is largely inferior compared to Thuban as most players try to hoard orbs at the bottom and this is counter productive. She also loses the haste but is on a short 5-turn cooldown. Her Dragon and Attacker Killer awakenings may have niche uses. Misato has an active similar to Ares in that she converts hearts and an additional element (dark) to fire along with a turn of haste. She has less ideal awakenings than Ares but is worth considering. Red Sonia is the weakest of all her sisters as her base stats and awakenings are rather lackluster. However, her board changer can be invaluable as you in theory only need 12 to deal lethal damage. In addition, she has the bind recover awakening so she can act as a very soft bind clearer. 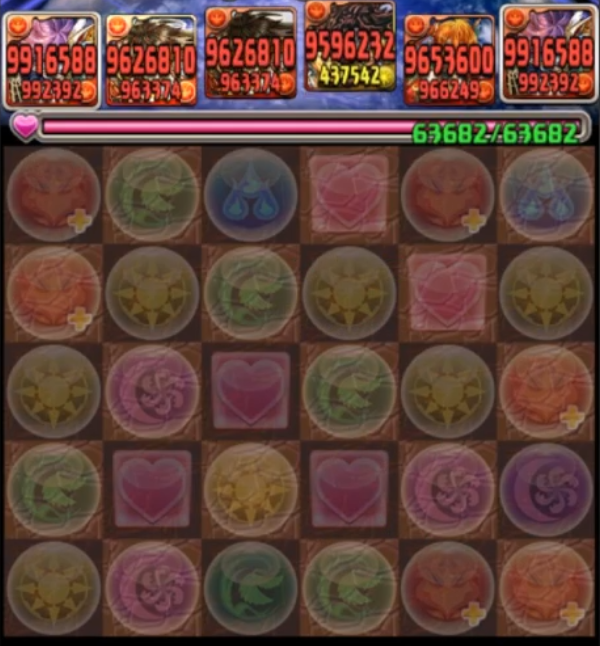 Awoken Freyr would be a more important sub if your Krishna team actually needs the enhance. Furthermore, the Norse Gods are starting to lose their stronghold on enhancing option of choice as the Gemstone Princesses are largely superior. However, Freyr has wonderful awakenings and the enhance can make two turns easier. Hino has a relatively low impact active as it essentially generates fire orbs on a 7 turn cooldown as the additional dark orbs and defense break are largely unused. However, his reincarnated form does come with 1,000 base stats and the triple TPA awakenings can have value if there are no damage absorbs. Set is what I consider an inferior Freyr on Krishna teams due to less ideal awakenings and a smaller burst component. However, his triple TPA can have value if there are not damage absorbs. Kiriko found a lot of popularity on Xiang Mei teams as she was one of the few natural board changing options available. However, Krishna can be more picky with his subs and her lackluster awakenings may make her a better assistant via Skill Inheritance. DIno Rider has been receiving various buffs over the past 6 months and is a respectable TPA orientated sub. He is also capable of removing jammer and poison orbs so it may provide more value than you originally thought. These subs are mostly niche or situational and applies to bind clearing as it is not always needed. Remember, if you play coop, you can use a soft bind clearer as you can have the correct person avoid the bind. Red Riding Hood is the most offensive bind clearing option from an awakenings point of view as she boasts 3 fire rows. This helps ensure she is not dead-weight outside of a bind clearing role as her passive damage is quite significant. The water to heart active along with 3 turns of bind clear can also be helpful for emergency healing. Ame No Uzume is the most natural fire bind clearing sub as she offers a 4 turn bind clear along with 4 turns of 2x RCV. The additional recovery component is largely wasted and simply adds turns onto the cooldown. However, it can come in handy if starved for heart orbs or to bait out status void dispels (think Grisar or Zaerog Infinity). Rozuel has risen in popularity due to finding a niche home on Ronove . However, her value on Krishna is somewhat diminished as you should not be focusing on TPA and her pure heart making ability coupled with a soft bind clear is not as reliable as Ame No Uzume. Guan Yu acts as a more offensive bind clearer as he is able to convert hearts and poison orbs into fire alongside a 3 turn bind clear. This is actually quite good value from an active skill perspective as it is only a 6 turn cooldown. However, his awakenings are mostly defensive in nature and you would not be bringing him all the time if no binds (or excessive poison orbs) exist. Tsubaki is a less ideal sub on Krishna due to a low impact active and no row enhances. Manufacturing only 3 fire orbs may not solve a bad board and thus wastes an active slot. I would not run Tsubaki unless you had no better options. Dantalion is a rarer and marginally stronger Tsubaki as he generates both fire and heart orbs. However, the same problem of only enhanced fire orbs and no rows still apply along with a low impact active. The Red Puppeteer is still a powerful enhance option against water bosses, but is largely unneeded for most content. Their awakenings are okay and Krishna teams should not need an enhance in most cases. Scarlet is the best farmable option available and has more potency than Tsubaki and Dantalion due to more synergistic awakenings and the additional fire orb generation. However, this is still a low impact active, but is a great filler while you wait for someone stronger. I do not recommend using Krishna as a sub on his own team unless no other option exists as your duplicate is much better off used as skill delay protection. Due to the innate flexibility of Krishna, you can essentially use what you have at your disposal and should try your best to bring a balance of orb changers, utility, and bind clearing as needed. You also need to take into consideration the mechanics of the dungeon, the damage requirements, and whether you are playing in coop or solo. In coop, you are better able to get away with soft bind clearers and allows you to better load up on orb changers and offensive awakenings. You are also able to further customize actives via Skill Inheritance (as discussed below). I feel that a relative core team consists of Sanada, Urd, and Yamato (in descending order) as they offer a diverse array of fire and heart generating actives, optimal burst board, and soft bind clearing. This would be a team that is capable of handling a wide variety of challenges and your flex slot should be catered towards your specific needs. For instance, you could bring any of the other top tier subs as required: Leilan , Ares , or Cao Cao . Krishna’s active skill generates fire orbs at random along with providing 3 turns of +15% fire skyfalls on a 6 turn cooldown. This means dual Krishna leaders are able to form a permenant skyfall loop, but this may not always be advantageous. Just because you can, does not mean you must use the active on cooldown as your playstyle differs from the guns blazing Sarasvati. Krishna is able to stall and tank multiple hits and this is made more possible with no skyfalls. Furthermore, you may not always want to generate those two fire orbs and it may be wise to save them for when you use a full board changer etc. The main point I want to drive home is that you do not need to use Krishna’s active as soon as it comes up as it may be advantageous to wait and this transitions well into his Skill Inheritance section. Skill Inheritance can be used to either upgrade an existing active, provide abilities that could not otherwise be accomidated, or as a means to protect yourself against skill delays. Regardless of how you choose to use Skill Inheritance, it is a powerful tool to add customization and another layer of power to your team. As Krishna’s active may not be used on cooldown along with your innate ability to stall, you can successfully inherit something to add another layer of utility. What you choose will be based on your situation and monster box; however, two outstanding candidates are a dupe Krishna for skill delay protection and Awoken Ares as a means to upgrade your active skill. Damage Enhance Should not need with 2/3 fire board. If you want to read more about Skill Inheritance, please refer to my advanced guide HERE. Krishna does not excel in any particular category in terms of stat distribution and would gain less value from the HP/ATK/RCV latents. Thus, I would recommend using your rainbow resist on him or even Time Extend if you are struggling to form combos. Skill Delay Resists are less important as his active skill is usually not vital to success and can easily be protected via Skill Inheritance. Subs such as Urd or Yamato who have more vital actives should be targets of Skill Delay Resists as their active ensures you can return to full health and deal damage. If your subs allow it, try to use your HP and RCV latents on them as the benefit will be 2.25x more and will most likely eclipse rainbow resists. If playing solo, I strongly recommend you use the bonus Recovery badge. Your team should already have sufficient health to survive any realistic attack and even the +15% HP may not make enough of a difference. This is because recovery is the most important aspect of a tank team provided you can survive any reasonable attack (which Krishna does). However, if the HP badge would allow you to survive an attack that would have other wise killed you, please use that one. Krishna is an incredible leader who is able to keep abreast with the heart cross meta. He is the strongest pantheon leader available and has the most flexible and gentle team building. You can use any fire sub while benefiting from the full leader skill. Hopefully Krishna paves the way for stronger tank teams as they have fallen somewhat out of favour over the past 6 months. Let me know what you think of Krishna and how you plan to build your team. I will be uploading various Arena clears in the next few days to showcase his gameplay as I managed to pull one on each account from the current Godfest and Memorial REM reset. i’m still wondering, why is Krishna so much better than Vishnu? Is it because of the Hp boost? Vishnu’s multiplier is heigher right? Also, the slightly higher multiplier is offset by Krishna’s OE and ability to better stack rows as he has a better sub pool to draw from. The last spot (?) I have ronia,scarlet,tsubaki,another urd or Gadius. I’m inclined to use Gadius due the pseudo clear bind, and I’m considering inherit sword dragon on him, and basically exchange the gadius board (useful btw) for a heart break + bind clear active. Since I have heart makers, that active can also used to combo with them when bind clear isn’t required. For inherit in Krishna, not sure yet but I’ll figure out. I’d say Gadius is a good option for your final slot; however, for the inherit, maybe using your second Urd is better. Urd will almost always provide enough hearts for a row and still retains synergy with Sanada. Ok, so I’ll do that. 2 SDR in Krishna and when I get another, 1 in Uriel just in case Saria be an bad girl. Im hoping to try tackle end game content with a krishna team but without the optimal subs im not sure how to make a good team. Thanks in advance for your help and the guide! Great guide! Might I suggest that you might want to include FD sanada as a sub, as when the stream buffs come out, he’ll bring 3 OE. Although he is overshadowed by FF sanada in terms of max dmg output, realistically it is not possible to match a row and two more fire combos without popping an active/stalling for fire orbs. The OE would allow you to focus more on consistent dmg and sweeping the easier floors on longer dungeons like arena where you can’t afford to pop a skill every floor to clear. Well Krishna is pretty amazing at stalling and your playstyle is slower than Sarasvati. More OE helps for easier floors, but when you get to harder/future content, you will need the rows more as you realistically need to pop actives to kill. I think you underrate napoleon’s contribution for krishna, the 3 turn shield on a 7 turn cd is a very strong utility to supplement survivability, i consider him to be almost core status for a krishna team. You don’t like fixed orb spawners. But you damn right! Krishna deserves all the hype and love, he’s Fantastic. I’d elevate RGY as a top sub for an offensive bind clear. Running no bind clear is unwise, and he is fast and fairly respectable. Thinking you can row break with Yamato is a chuckle when he eats a bind or randomly proves to be an unreliable narrator on available orbs. Appreciate all the work that goes into this level of content. Thats the nature of a soft bind clear: it has risks but if the risks are managable/can be planned around, it is worth while running him as your option. The thing about RGY is his awakenings are pretty lackluster outside the bind clear (auto heal is nearly pointless) so he has a lot more dead space than some soft bind clearers. He has the most offensive active of all the hard bind clearers, but worse awakenings than red riding hood. Thought’s on inheriting A.Freyr on Krishna? or his other subs for the burst enhance. Mostly likely we don’t need spikes. But drop Silk somewhere on your team to do something bizarre 😛 and she also clear binds. Excellent guide, thank you for taking the time to put this together. A quick question and thought on the possibility of a very niche sub: While Krishna’s passive multipliers only apply to fire, does his fire combo attack multiplier boost any and all damage from the team or only fire damage? The wording on the card is vague. Because if picking off specific water monsters is a problem, one could run a Twin Blade Shotel (especially in co-op where the loss of one, even two slots between two teams wouldn’t be so bad, and the co-op awakening bonus would apply) and use its active to convert its damage with its 2 TPA’s and coop bonus to wood for one round in addition to the 1.5x attacker bonus from its active which would benefit quite a number of key subs such as Sanada, Yamato, A. Leilan, Ares, Dantalion, Napoleon etc. If that wood damage gets an attack bonus from Krishna’s combos as well, that could be enough to spike a tough water monster or two in a given dungeon. As for me and my three Krishnas, I’ll be running a core of Uriel and Gadius with some assortment of RRH, Ronia, Horus, R/L Tsubaki, R Tsubaki, Gadius no.2, Krishna no.2 or Freyr in the final two slots until I can roll upgrades (Homura might even rise from his grave). This means no +eggs on anything but lead Krishna for now, but with four Sarias, four Verdandis, Orochi, even Zeta Hydra and Indra, I can hopefully mitigate the awfulness with some useful SI’s. * I have no idea how voting works in PCGF, do we get to cast a vote on only one monster? A shortlist? Or is it some kind of ranked ballot? Regardless, Sanada is no.1. Ah good to know re: PCGF, thanks! I’ll file Shotel under: “Neat trick, kid”, if/until there’s some water content that can’t be beat straight up. Shotel is a primary fire element (with wood sub-type), it’s her active that changes her damage to wood for one round (in addition to the 1.5x attacker buff that has synergy with herself and a lot of key Krishna subs). I’m glad Fire Insect Dragon is coming back this week. I also hope gungho addresses older thank teams. Even Norse/Dragonbound teams can’t compare to Krishna. Ilm is missing in the board changer skill inherit section. The Kunoichi from Kenshin collab breaks light+jammer to fire while having a 30% max hp heal. Might want to put her in the inherit monsters list. Is Krishna better than the perfect Xiang Mei team? Hey man, love your site and input on everything PAD. Wanted to mention that I have found success running Ilm on my Krishna team. Takes a little while to activate, but gives me great burst for a Boss level when I’ve used all my other actives. Ilm has a strong active, but the inverted colouring does dilute your damage. Do you have a fire card you can use and inherit Ilm over top? He’s all grown up now! Thanks for the review and analysis btw. I only have one Cao Cao whose maxed skilled with an ultimate evo. Would you recommend changing him to the awakened version instead and foregoing the skillups I put into him earlier? Super happy to have a home for leilan and also to have so many options, for a change! Trying to decide on the K inherit…Chiyome, Verdandi or Haku even. I don’t think I need to inherit a delay, already have with ACC. ACC could use an inherit too…so many good options!l to choose from. I’m looking at my bind options, who I should keep around for dungeons with binds… Maybe Belial with RRH or Ame inherited. Zuoh also makes a good inherit if you run Yamato, combos perfectly. Inherit RRH, Ame or LMeta onto ACC? Lmeta is ready, the others need work! Yup. Good point! he stinks at RCV and his amazing hair can’t make up for it. Lmeta will have to get me through until I can prep Ame for transfer (just got her last gf). Got the tans today, but box is empty of red xp post Krishna team building. Now the next question is whether to inherit zeta hydra or another Krishna on Krishna. So many choices so little red XP…none of which is for Squall. What a box turd. Krishna is so much fun to play! I needed a break from Myr. I wish GH would modify Pandora or a similar dark leader to play the same. Zeta Hydra is mostly for an easier time dealing with Vishnu in A2/3 or various resolve bosses (which ACC can do). Sounds like a solid plan. Thanks for the advice, much appreciated. The other Krishna will continue to be a flute-playing bandleader for all the other cheerleaders. You are very welcome and hopefully your box appreciates the music! A Krishna team is now a priority, as I’m used to play tanky teams (APandora, ALuci and DMeta with 63k hp), my temptative team should be something like this: Krishna, Sanada, AAres, G/R Cao Cao, Gadius. What about using R/L Ares instead of AAres? He’s in unevolved form and I’m short of Flampies (should I save them for ACaoCao?). What can I achieve with a team like this? I am certain you can overcome Journey to the West! I tend to write guides on the more popular leaders and I am glad they help you out too! Yeah, your guides are super useful Man, I enjoy them so much! As for Krishna, I’m really enjoying his playstyle, even with an incomplete team (Krishna and Sanada not fully awoken, Gadius at level 68 – I did use Verdandi instead of Ares, UEvoed him this morning) I’m doing well, lots of damage compared to ALuci who was my main (thank you for all the fish Aluci, see you later). Can’t stop wondering of him when I’ll complete my team! Well, I can get some Flampies from Maniac Quest and this week Challenge Dungeons (yeah, I can reenter the Py dungeon if he’s of the wrong colour!) for ACaoCao, this will be a really Hot Christmas! Marubini, cotechino (tipical winter dishes of northern Italy) and a fully awoken Krishna team! Love this guide quit PAD for a few months gotta to catch up by watching these review blogs/videos. Question tho, I have a Shiver and Krishna, which one should I invest in? is Shiver not good enough ? As stated below, Shiva is faster to play but less consistent in end game dungeons due to no HP multiplier. However, he has far better recovery potential. Krishna is much better. Shiva is somewhat fragile. Of course, the final decision will depend on the subs. I recently got Krishna and apparently have some of the best subs for him in Sanada, Awoken Cao Cao, and Awoken Leilan. I am missing Reminiscent Norn, Urd but I do have Resting Norn, Urd who does have the same active skill. My first question is should I inherit my Resting Norn, Urd onto one of the others in the lineup or should I use Resting Norn, Urd in the lineup? My second question is with the following possible subs; whom should I create a god team with? I think bind clears will be my biggest problem as I don’t think I have any outside of inherits. Thanks and keep up the great guides! I would run sanada, acc, and leilan as your core subs and utilize your final spot as a flex as needed. You can always transform your acc into a bind clearer via skill inheritance. Thanks for your work dude, helps a lot. Just discovered you when I got back into the game, a lot more helpful than the PADx site! Anyways, I just got my Krishna and think I have some pieces to run a mono fire team. But I don’t have any of the ones you listed unfortunately as the prime subs. Do you think it’s worth investing time into..
Hello! I’m in the same predicament as you since my fire box isn’t the greatest. But I also recommend using a Krish team! The monsters that caught my eye were: Belial, Yamato, Ame no Uzume, Ronia, Dantalion, and Kuvia. You could definitely use your other Krishna as an assist on your main Krishna! I would definitely put Yamato Takeru in your team. I would also put Ame no Uzume in your team as an emergency bind clearer since Krish is vulnerable and so is Yamato. But Belial is also bind resistant too. I saw a few people recommend putting Sonia on Hino Kagutsuchi as an assist on reddit. What do you think about using shiva as a sub? If i had no other sub, would shiva not be good for its row enhances? Actually, my current team subs has Belial, Yamato, Dantalion with flex of Hino, Ame or even Echidna. Working on Minerva and waiting on Kuvia evo to come to US. Has gotten me pretty far even with non optimal subs. Mantastic is right, many viable subs out there and you can get far even with second tier cards. You are correct in that a non-perfect team can clear plenty of content. It may simply mean it is slower or less consistent overall, but it can get the job done. Hi Hi, I’m in dilemma on who to use as subs on my Krishna team. So far I have Sanada, Minerva, Cao Cao and Urd. Do you think I should change my lineup or switch it up ? Mantastic, these are my thoughts for a Krishna Team… Krishna (Napoleon), Gadius (Silk/ROdin), Uriel (Ilmina), Yamato (Elgenubi), Sanada (NY Leilan). With a friend Krishna, that gives me 15 rows, 11 OEs, 4 time extends, 8 S+, and 5 Sx. I do have a Beach Urd I could switch in as an assist if absolutely necessary, but she’s currently a staple on my Sumire team. Her Red sister continues to illude me. Thoughts? Thanks! I would suggest not overriding Sanada’s active skill as it is quite powerful overall. Thanks for the input! Hopefully I’ll pull the illusive Urd in the near future. You are very welcome and best of luck with urd! How can I optimize my team? Hino, shiva, baldin, rodin, tsubaki, leilan, leilan, ares, squall, belial, verdandi. All are max level & Max skilled. 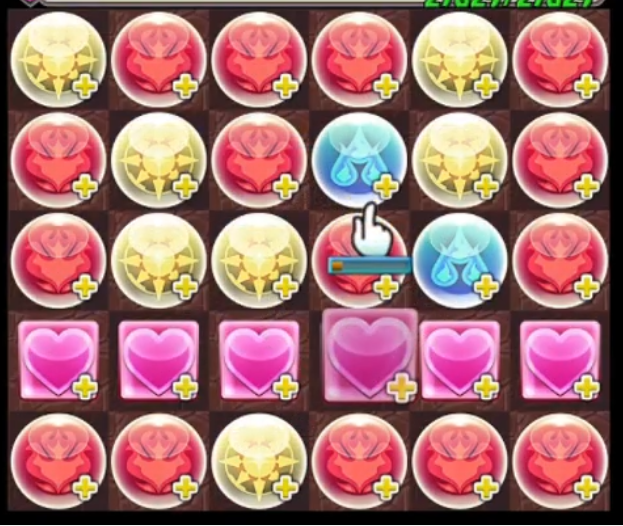 With the option to change Purple,Yellow,Hearts,Blue orbs to red there are not many dungeons that cant be cleared. Throw in Minerva’s defense breaking ability and content clearing is a snap. I have a Krishna row team made up as well but for the “I WIN” no thinking involved experience… you cant go wrong. Thank you for the great article! Right now I am running Krishna, Uriel, Gadius, Ronia, and Homura all at max skill. I also have a second Ronia, Silk, Scarlet, Mitsuki, Fire Chester, and a max skilled Gigas. I’m trying to figure out skill inheritances and also if running Scarlet/ Silk would be preferable to Homura. Thanks so much!